All elements of American life began "heating up" in the 1960s. Since the early 1960s, the Civil Rights Movement had been fighting to eliminate racial segregation and the oppression of African-Americans. An off shoot of this was an increased interest in Africa and African culture. Feminism got a new lease on life after the publication of Betty Friedan's The Feminine Mystique in 1963. Increasingly the role of women in modern America was question. American women increasingly looked beyond the family for "fullfilment". The impact on our society and children is yet to be fully assessed. Protests erupted against the Vietnam War in the mid-1960s. Hippies held the first "Be-in" during 1967 as they revolted against the values of what they saw as a consumer-oriented society. Some experimented with hallucinogenic drugs for escape. The impact on consumer textiles of each of these events was significant. African-inspired textiles became popular. Blue jeans were ubiquitous, worn morning, noon, and night. Young protesters and hippies adopted blue jeans and incongrously, Army fatigues, as virtual uniforms of the movement and a symbols of solidarity with working people. Psychedelic colors and patterns adorned their tie-dyed and hand-painted garments. The unifying themes of the protest movements during the 1960s was to question authority. This filtered down to all aspects of our culture and society, not the least was fashion. The primary group participating in the movement was older teenagers and young adults. They were the fashion setters. Younger boys, however, soon followed their lead and the new fashions soon appeared even in elementary schools. Boys and girls rejected the "nice" traditional clothes desired by their parents. They wanted the tie-dyed shirts, fatigues, and jeans worn by the teenagers they emulated. As part of this pricess, short pants suits began to disapper. This was especially true inAmerica, but the process was also notable in Europe. The ever-hungry fashion industry constantly sought new ideas and inspirations. It was not long before these symbols of protest had been co-opted by mainstream fashion, with varying results. Blue jeans, of course, are still with us, but the polyester double-knit pantsuit left the fiber with a negative image that polyester producers are still trying to live down. Comediand still use polyester leisure suits as a source of derision. Fashionable psychedelic-printed textiles were worn by men, women, and children in garments ranging from underwear to men's shirts. Mens' and boys' clothing styles also changed radically in the 1960s. Esquire called the newly colorful men's styles "The Peacock Revolution," and men and boys of all ages felt free to grow their hair long and wear colorful prints, leisure suits, and Nehru jackets. Parents and schools at first resisted, but by the end of the decade, long hair for boys had become increasingly common. The 1960s were a dividing point for American and European boys between the classic styles of the 1930s-50s and the styles more in vogue today. At the beginning of the decade mny Europoean boys, still some teenagers, wore short pants suits. By the end of the decade only little boys were still in shorts and even more important, fewer boys were wearing suits at all. Informal casual clothes became increasingly dominate. The Civil Rights Movement and the War in Vietnam were major events in America, causing young peope to question authority and a host of previously unsalable social coventions. In Europe the Anti-War and Anti-Nuclear campaigns flourished, the enviromental movement expanded. In Western Europe the 1969 Paris student movement put a massive crack in the ossified edifice of French education. One outcome was the virtual disappearance of French school uniforms. There were even stirings hehind the Iron Curtain that were to lead to the Prague Spring in the 1970s. Wile these movements had massive spcial implications, one impact was that children, even young children took control over what they would wear. Moms by the end of the decade could no longer dictate what their children wore or in many cases how he cut his hair. Well this was most vapparent with teenagers, even elementary children gained considerable influence over their clothes. While increasingly rare, a few boys were nicekly dressed in the 1960s. British fashions still influenced American mothers, a least wealty or well to do families. The Kennedy's had a great impact on American fashion. Jacki's impact on womens' fashions was legendary. The Kennedy children impacted children's fashions. The most famous Kennedy boy, of course, was John John. His wearng of a short pants suit, with rather short shorts, in the middle of the winter was noted by many mothers. His shortalls and red strap closed-toe sandals also impressed fashion concious mothers. Even after going to New York he was often seen in shorts, knee socks, and "t" bar sandals until he was about 10. These outfits probably did't indear John to his friends. (Incidentally John didn't like to be called John-John, his famous kickname appears to ' have been a press creation.) Jacki's choices in clothes for both John and Carolyn were more English than American. While noticed, few American mothers could keep hope to keep their boys in shorts passed the shortalls/Eton suit phase. Perhaps more influential was John John's bangs. Ethel Kennedy kept her younger boys in black short pants suits and knee socks. But these were the last few times that such fashionable clothes would be seen on American children. Movies and Televison: Interesting details on boys' clothing styles can often be seen in old movies and television shows or shows with period settings. As in the later 1950s, the boys pictured on American television never wore short pants. Certainly not for dressy occasions, but not even for play. Congress passed the Textile Fiber Products Identification Act (TFPIA) in 1960. The proliferation of manufactured fibers proved confusing. When only natural fibers and rayon were in use, it was relatively easy to tell one type of fabric from another. With manufactured fibers, and especially with blends, it was virtually impossible to know just which fibers one was dealing with. TFPIA simplified matters by requiring that apparel be labeled as to fiber content. Boys in America increasinly reserved theirbsuit for very special occasions. Even church did not merit a suit Boys' suits were mostly single breasted with narrow ties and lapels. There were also some new fabrics such as searsucker. Some boys wore searsucker or Madras jackers with contrasting shorts. Cord suits were also available. Boys mostly dressed up in long pants suits. Short pants suits were never as common in America as in Europe. As the decade progressed fewer and fewer boys dressed up in shorts. Some little boys wore shortalls, a new style intoduced at the beginning of the decade. Jackie Kennedy and the way she dressed John John had the impact of promting this style. Slightly older little boys might wearEton suits. At about 7 or 8 they might get regular short pants suits which they would wear for a few years, but rarely beyond 10 or 11. By the end of the decade, however, even this was declined greatly. For most American mothers it was a struggle beginning at about 7 years to keep boys in short pants suits. Most of the parents that did were wealthy and sent their children to private schools which had short pants as a uniform. Knee socks were not as common as in Europe, but worn by well dressed boys for special occasions. As the population moved to the more informal suburbs, boys dressed up less and less. Suits and even blazers were less commonly worn. Even occasions formerly requiring suits and ties such as church and parties increasingly were more casual events for boys. As a result, dress occasions like church or dance classes were often meant a mix of clothing. Some parents holding to the old conventions. At the beginning of the decade there would still be some boys up to about 12 in short pants suits. By the end of the decade, however, only younger boys of 7 or 8 years might be seen in dressy shorts, and even this was increasingly rare. Shorts were becoming increasingly popular among boys as casual play wear. They certainly appealed to hard pressed moms because of the ease of washing them. Manufacturers had found consumers receptive to clothing that did not require ironing but that also had the look and feel of cotton. Clothing was given wrinkle-resistant finishes (these had first appeared in 1929). Resin-finished cotton or cotton and polyester garments were marketed as "wash-and-wear" or "easy care." A new style was inroduced, "camp shorts" with larger pockets. Toward the end of the decade "cut offs" became popular. They emphasized that they were casual, not dress wear. The idea being that one did not purchase a proper pair of shorts, but rather salvaged an old pair of worn out log pants bt cutting off the legs. Some younger boys began wearing these casual styles to school. Older boys could now be seen wear Bermuda shorts" or "Bermies" for casual wear, always with white athletic socks and tennis shoes. While dress shorts were becoming less common, play shorts were becoming more popular. 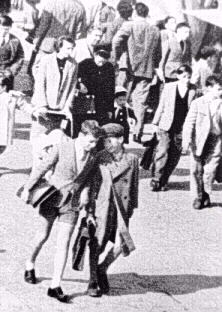 Many boys in England commonly wore short pants suits at the beginning of the decade. The suits were generally worn with knee socks. Shorts on even older boys were still common at the beginning of the decade. Parents were, however, beginning to discuss the fashion of having boys werar shorts, even in the winter. But this style passed to younger and younger boys as the decade progressed. By the end of the decade almost few British boys beyond the age of 11 still wore short pants suits, although many boys, even some in the first years of their secondary school wore shorts. (Some private schools still required all their boys to wear shorts.) British Boy Scouts went to long pants, further influencing the trend away from shorts. School uniforms began to change in the 1960s. Most schools still required them, both state and private schools. Caps began to disappear. Toward the end of the decade, older boys began tomlobby for long pants. Womens' styles changed again and may affected boys' styles. One new fashion appears to have had a significant impact on boys' fashions. Skirt lengths began to rise higher and higher. Rising hem lines and "hot pants," very brief short pants, for young women were widely discussed in the press. This made boys in older boys in England and the Continent still wearing shorts, generally as part of a school uniform, increasingly self conscious and by the late 1960s and early 1970s even conservative schools were shifting to long pants. In Europe shorts were still common, but becoming less so. The Paris student movement that eruted in 1969 had a great impact on Frech education. An off shoot of the empowerment of young people was the rapid disappearance of short pants suits for boys even in elementary school. The disappearance of dress shorts was part of the increasing influence of the boy's own opinions. This was facilitated in the late 1960s by the anti-war movement and the decrediting of adults abnd adult conventions Wearing old ragged clothes became stylish. Boys didn't want to wear suits at all, especially short pants suits. Unlike England, Continental European schools were generally less insistent on shorts and by the end of the decade it was realtively rare to see an older boy in a short pants suit. A few private schools did continue to require shorts. French and German boys, like their American counterparts all wanted to wear jeans. American boys did begin to wear shorts more for play.